In recent times [c. 2010] there has been a string of high profile, so-called ‘political’ artworks supported by mainstream arts institutions, and featured heavily in the media. Anti-war protest art such as Mark Wallinger’s State Britain (2007), an exact replica of Brian Haw’s one-man peace camp re-located from Parliament Square to Tate Britain, or Jeremy Deller’s It Is What It Is (2009), which took the wreckage of a car destroyed by a bomb in Baghdad on a tour of art museums across the USA, have been widely feted by the cultural establishment – both artists mentioned have been awarded the Turner Prize, for example. But what is it that public-funded institutions find so appealing about art that purports to be political, especially as such works would seem to directly criticise the policies of the very state that funds them? Or perhaps the question should be turned around to ask, what does it mean for the political efficacy of the artworks to be so whole-heartedly embraced by the cultural institutions of the state? 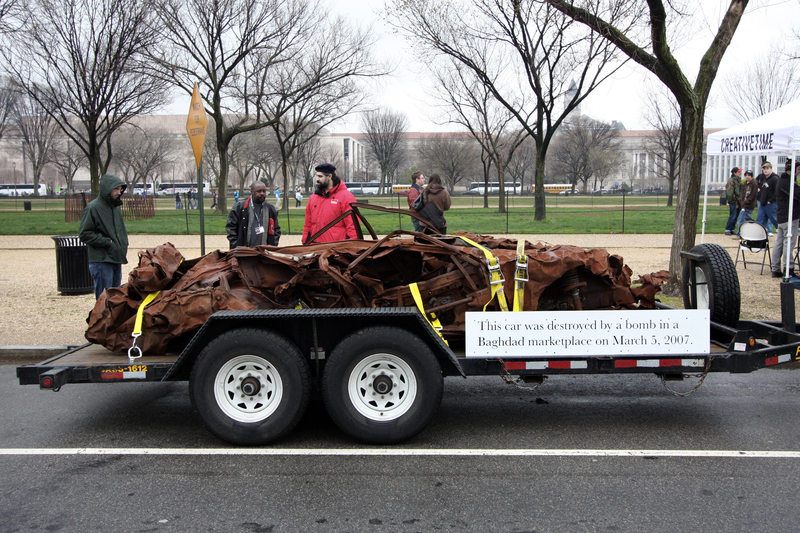 There is, of course, a long tradition of artist / activists in contemporary art, from Joseph Beuys to the Artist Placement Group, the feminist art movement of the 1970s to the environmental activist groups of today. Reflecting upon one’s own individual relationship to social conventions, or how ‘my’ experience is translated and represented in the wider world, is inherently political, inevitably bound up with an awareness of the distribution of power in society. However, as soon as this process of reflexive inquiry becomes involved with the institutional structures of art, the focus of the questions must inevitably shift away from a straight forward critique of the politics of representation, to the more introspective issues of recuperation and one’s own implication in the processes of absorption and neutralisation by the mainstream. Since the 1960s many artists, from Hans Haacke to Michael Asher, Fred Wilson to Andrea Fraser, have made work which specifically takes as its subject a critique of the institution that houses art, and the structures – financial and ideological – that support them. However critical such art may itself be, paradoxically, it also serves to highlight the institution’s liberalism by allowing it to be there in the first place. Inevitably such inclusiveness defuses the very criticism being offered. It is as if the critique has been turned into a form of validation; as if the act of ‘dissent’ has been drained of its power to effect change and turned instead into a hollow signifier of liberal democracy in action. Thus, despite an individual’s best intentions, as soon as they partake in the public discourse of contemporary art they are inevitably implicated in a process of recuperation. Guy Debord, co-founder of the Situationist International in 1957, described recuperation in a sociological sense, as the procedure by which the mainstream takes a radical idea and repackages it as a safe commodity for consumer society. According to Debord, recuperation is a process by which “avant-garde innovations might be recovered for use by the reigning social order, that revolutionary negativity might be recouped to strengthen bourgeois affirmation.” The mainstream apparatus actively feeds off the energy of dissent and gains strength from it. As such, the Situationist notion of recuperation was a further development of Antonio Gramsci’s concept of ‘cultural hegemony’, which theorised the ways in which one set of bourgeois values are normalised as everyday ‘common sense’ by allowing space for dissent. Of course such an idea is immediately in danger of recuperation itself. Debord’s strategy therefore was to employ the language of consumerism but to turn it back upon itself. In The Society of the Spectacle, he defines the principle of ‘détournement’ as using mainstream communication but including an element of self-critique within it in order to turn the attention of passive consumers of spectacle culture back towards the material considerations of everyday life and historical struggle. As capitalism has fetishised the ‘sign’ (the seductive images of consumerism), Debord argued that by adopting the language of spectacle culture, but including a reflexive critique within it, the underlying contradictions would be revealed. 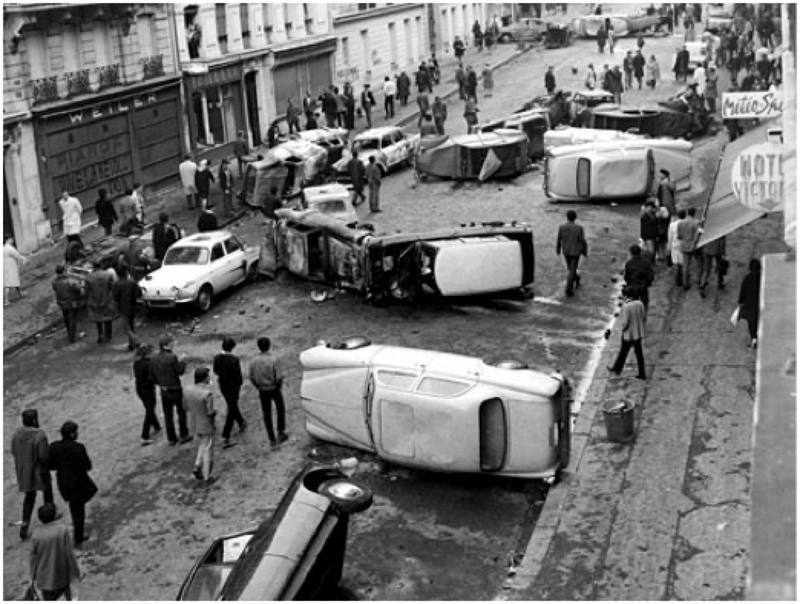 Situationism came to the peak of its influence in the protests of May 1968 in France. It was decided to bring the group to an end in 1972 as, according to Debord, they wanted “to destroy the revolutionary commodity it had become”, saying “the more our theses become famous, we ourselves will become even more inaccessible, even more clandestine”. Ironically, the shock tactics and mocking, cynical attitude of disengagement put forward by the Situationists went on to spawn punk in the late 1970s in the UK, which started out as a radical style of refusal but very rapidly became sanitised and re-packaged as mainstream popular culture. The resistant attitude of Situationist ideology was thus itself commodified and recuperated by the market, leaving the likes of Joe Strummer to lament, in vain, about “turning rebellion into money” (in the Clash’s best-selling record, White Man In Hammersmith Palais), while fashion entrepreneurs Malcolm McLaren and Vivienne Westwood cashed in on the new-found marketing potential of rebellion. Whilst punk would undoubtedly not have had such a far-reaching impact if it were not for McLaren’s instinct for hype and the intelligence with which he played the media at its own game, it is also undeniable that, in the years since, the market has made full use of the consumer appetite for shock and the re-packaged signifiers of so-called ‘counter-culture’. Indeed, in his book Hello I’m Special, Hal Niedzviecki describes the post-punk model of rebellion as the ‘new conformism’, where we are all “invited, urged and commanded to rebel against the system to gain access to the system”. It could be argued that the true inheritors of the Situationist tools of détournement are the advertising executives and media spin doctors of the last decade or, in respect of the art market, Banksy, Damien Hirst and Tracey Emin. So, what is to be done? If every action one takes to try to change society is simply turned into so much fuel to sustain the prevailing order, would it not be better just to do nothing? While reflexivity enables an understanding of one’s own implication in the processes of recuperation, such self-consciousness can lead to a kind of paralysis and ultimately become an obstacle to change in itself. ‘Institutional critique’, for example, has become a standard strategy for contemporary art within the museum, so much so that it is beginning to seem like an orthodoxy that stifles any other form of critique, effectively marginalising more direct artist / activist practices in a wider social context. Under such conditions, what are effective strategies of opposition? The maxim (generally attributed to Gramsci), “pessimism of the intellect, optimism of the will”, deftly sets out the challenge of nurturing a self-critical yet constructive scepticism that still does not fall prey to cynicism or passive resignation in the face of seemingly overwhelming forces. ‘Pessimism of the intellect’ is only constructive if, while remaining sceptical in the best Enlightenment tradition, it avoids the cynicism that can undermine ‘optimism of the will’. Thus, whilst the pessimist’s analysis might be that hegemony has learnt to feed off dissent, it does not mean that one should not continue to voice that dissent, in full knowledge of its imminent recuperation, and so pursue change, teetering on the edge between activism and absorption. In terms of the institutions of art, parallel to the increasing corporatisation of larger museums and cultural spaces that has been taking place since the 1990s, new forms of more flexible organisation have emerged in close alliance with artists’ critique. Whereas in the 1960s critique was directed against the institution from the ‘outside’, more recently this reflexive principle has been internalised by the institutions themselves as a kind of auto-critique so as to effect change from within. What is fundamental to the new concepts of the more progressive institutions is a radically different understanding of the public sphere and thus the structure of public spaces. Rather than conceiving of a singular, homogenised and essentially passive public, which demands a populist programme of mass appeal, the so called New Institutionalism seeks to actively ‘produce’ multiple and diverse communities of interest as co-generators. The public sphere is considered as a space structured by diversity, in which different conflicting interests exist in parallel. With the recognition of dissonance as a productive force, the more progressive art institutions therefore seek to create “a democratic space of polyvocality”, as Nina Möntmann describes it, in which the public takes an active role as producer, and from which new social and artistic structures can emerge within civil society. Thus, in theory, the institution becomes a means for involving art in democratic processes, a means for re-politicising art. Through the mediation of progressive institutions, art is therefore able to introduce subjectivity back into the democratic process or, as Lars Bang Larsen has written, “introduce levels of desire into political concepts”. Post-1968, Michel Foucault fundamentally re-shaped an understanding of the relationship between institutions and subjectivity, and their relation to the idea of cultural hegemony. The asylum, the prison, the school, all of those institutional bodies that form the disciplinary matrix of modern society were now analysed as mechanisms of discipline, and the kind of subjectivities they produced as modes of subjection. Foucault characterised his work as a ‘genealogy of the modern subject’: a history of how people are constructed as different types of subjects, whether as delinquents, homosexuals, mentally ill, or, through such exclusions as ‘normal’ and ‘healthy’. By focusing on the ‘histories of the present’, such as the history of sexuality, madness or criminality, Foucault aimed to show how our subjective conceptions of reality and social relations are entirely relative, shaped by “a precarious and fragile history”. It is only by studying how we have become what we are, that we can begin to imagine becoming something else. Thus Foucault’s archaeologies and genealogies are explicit efforts to re-think the subject, so as to enable the transformation of society. Supposedly, contemporary art has always been a space for re-thinking subjectivity. The order of the day then becomes to forge new modes of subjectivity and to re-shape the ‘economy of desire’, as described by Gilles Deleuze and Felix Guattari, redefining desire as a form of productivity rather than a manifestation of lack, and thus as an instrument of liberation. In his late work The Three Ecologies, Guattari extended the definition of ecology to encompass social relations and human subjectivity, as well as the environmental context, as the inter-connected sites for the transformation of society. He argued that just as nature is threatened by the forces of globalisation, so is society and our own mental health. Perhaps it is within this framework, and through the mediation of its more self-critical institutions, that contemporary art can begin to produce a space of democratic multiplicity that enables an exploration of the relationship between subjectivity and hegemony, ever mindful of the thin line that exists between activism and recuperation. This entry was posted in Writings and tagged recuperation; mark wallinger; jeremy deller; anfrea fraser; institutional critique. Bookmark the permalink.